For Honor is a game of two halves. One is underwhelming; the other is brutal, bloody, and brilliant. 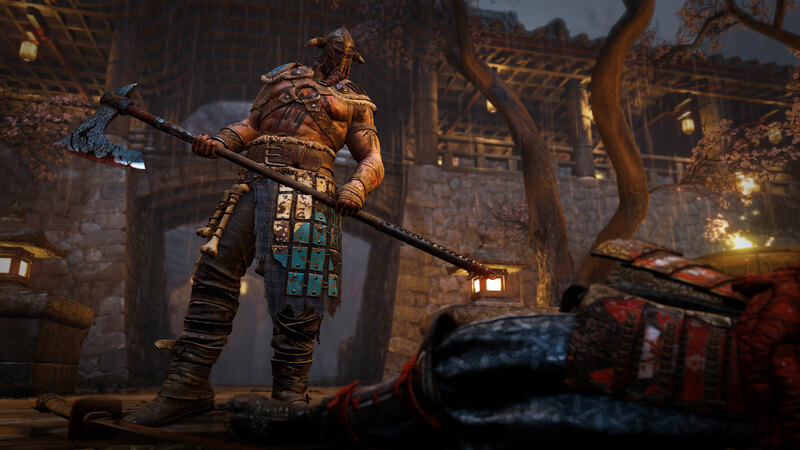 In development for some five-odd years, For Honor is Ubisoft Montreal's attempt to articulate the noble art of sword fighting – subject matter previously explored in detail in only a handful of video games. That's not to say that there haven't been plenty of titles over the years that have featured swordplay. It's just that the vast majority of them simplify their blade-oriented combat into hack 'n' slash action that bears very little resemblance to the real thing. 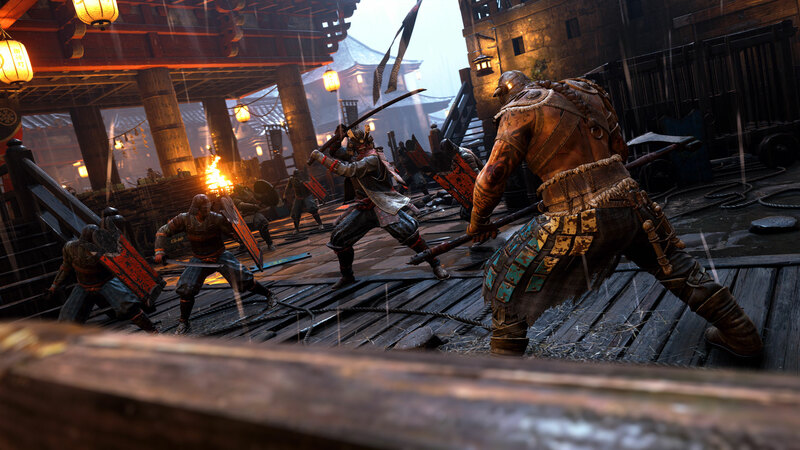 For Honor takes a completely different tack and joins a select few games – Bushido Blade, Chivalry, and Mount and Blade spring to mind – that really go the distance to try and capture the cadence, feel, and flow of sword fighting from a more realistic standpoint. 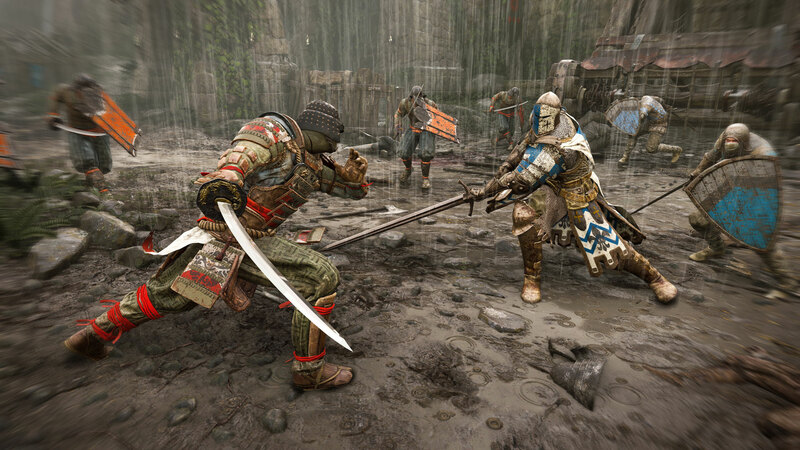 Using a control system called "The Art of Battle," For Honor features quite complex and nuanced combat in which participants circle one another, attacking with a range of openings and combos, and blocking, parrying, and dodging their opponent's attempts to hit them. While it's still quite arcadey, For Honor's combat nevertheless has far more depth than the swordplay seen in most games. Weapons have weight and momentum, moves take time to wind up, and once they're executed, you're committed to follow them through. There's no spamming buttons in this game, and you're not going to get anywhere hacking away at the enemy – at least, not unless they're completely inept. Instead, you need to watch what your opponent is doing, so you can out-think, outwit, and out-maneuver them, perhaps goading them into attacking you, so that you can dodge or parry their moves and then counter-attack. Or maybe you'll go on the offensive, trying to break through their blocks with a guard-breaker, so you can follow up with a combination of deadly chained moves. For Honor's controls definitely take some getting used to. On the one hand, you need to react very quickly to be able to block and defend against incoming moves, while on the other, successfully stringing together attacking actions requries very precise and steady timing. Do so correctly, and your hero gracefully flows from one maneuver into another as they smoothly attack and defend. Mis-time your motions, however, and the swordplay feels horribly clumsy and uncoordinated. 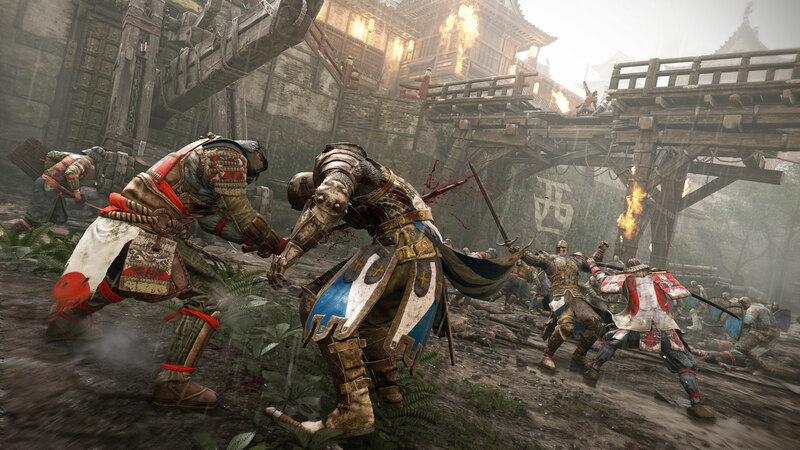 Because of its fairly high level of sophistication, and the tightness of its timing, For Honor has quite a steep learning curve. I didn't find its control scheme particularly intuitive, and consequently had to sit down and really learn how to play the game. Fortunately, it has a very well designed tutorial mode that does a good job of bringing you up to speed on the basics, and then enables you to fight against quite tough bots so that you can get to grips with the intricacies of combat. I definitely recommend spending time with this aspect of the game, because it allows you to practice the deeper aspects of its available moves – particularly parries and counters – and mastering these is key to successful play. 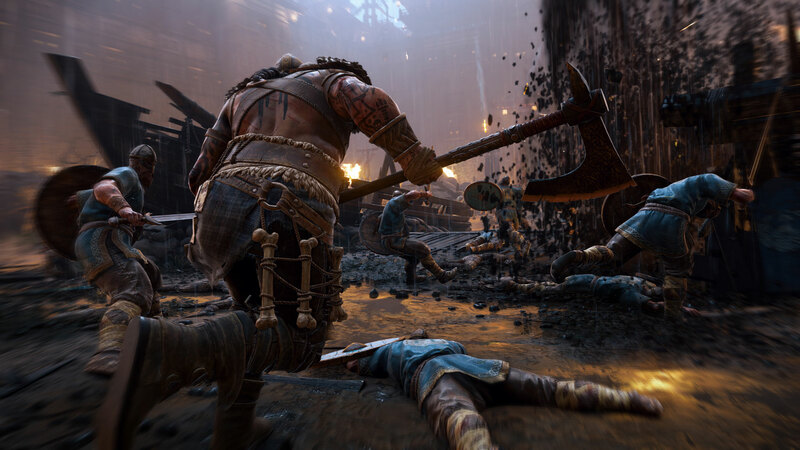 Speaking of which, For Honor features a variety of multiplayer modes, as well as a single-player campaign. The former is the real meat of the game, and where its long-term appeal really lies. Before you enter multiplayer, you first choose a hero from the three that are unlocked at the start of the game. They’re actually all Vanguard class, and there's one for each of the game's three factions – Knight, Samurai, and Viking. Vanguards are the most balanced of the heroes – they're generally strong in all aspects of combat, but don’t necessarily stand out in any particular area. They're also For Honor's least difficult heroes to pick up and play, which is why they're only characters available to play when you start the game. The three other hero types are Assassins, Heavies, and Hybrids. Like the Vanguard class, each has its own unique playstyle and moveset that gives them distinct strengths and weaknesses on the battlefield. As the name might suggest, Assassins are designed to be the most effective heroes when it comes to fighting enemies. They're fleet of foot, and have a variety of high-damage attacks at their disposal that can make them quite deadly in 1 vs. 1 combat. This more offensive nature is offset by the Assassin's relatively small health pool, and their inability to be able to hold a block. Instead, Assassins have to effectively time their blocks to successfully thwart an incoming attack. 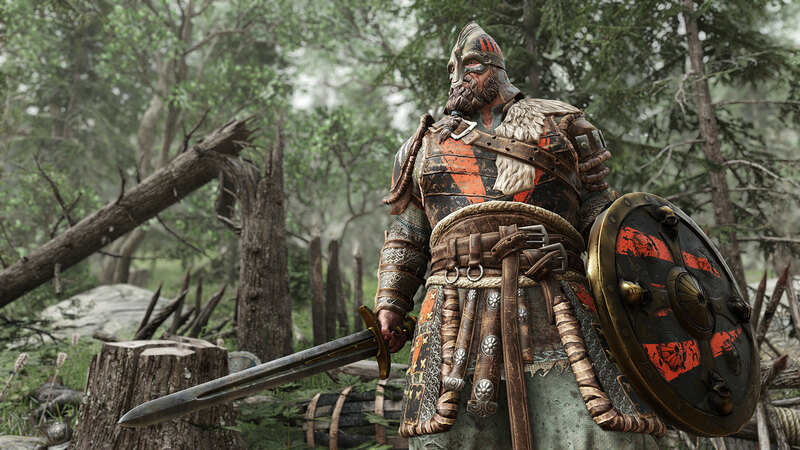 Perhaps For Honor's most interesting hero archetype is its Hybrids. These heroes wield longer-ranged weapons and, depending on the faction you choose, combine aspects of two other hero types. The Knight Hybrid, Lawbringer, melds characteristics of the Heavy and Vanguard, while the Samurai Hybrid, Nobushi, features aspects of the Vanguard and Assassin. Choose the Valkyrie, the Viking Hybrid, and you'll find it has a playstyle that's a mashup of Heavy and Assassin. Finally, there are the Heavies. These are the game's tanks, and feature the largest health pools of all the heroes, as well as the strongest defensive capabilities. Their movement and attacks are quite slow, but they can pack a significant punch whenever they connect, making them quite challenging to take down. Because of this, Heavies are good for defending objectives, and buying time to enable their team to rally to them. 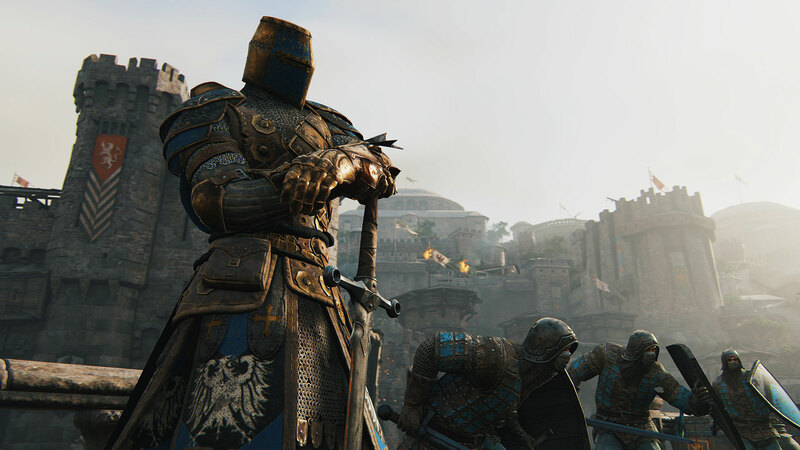 Once you've selected a character, you can then take him or her into battle in one of For Honor's five multiplayer modes: Dominion, Skirmish, Elimination, Brawl, and Duel. The former two are score-oriented encounters, while the latter three are single-life elimination battles over the best of five rounds. Those who want to experience the adrenaline rush of taking on another player in pure one-on-one combat are perfectly served by Duel. However, this mode definitely isn't something to play if you're new to the game. I've found from experience that most people who duel really know what they're doing, and if you don't, you'll be taken apart with ease. That said, it's a great way to learn the intricacies of combat, and garner an in-depth understanding of how different kinds of characters can be played. The good thing is that this mode enables you to battle AI opponents, which makes for very worthwhile practice. At their highest level, bots are really quite competent, and a good measure of your abilities: Once you're able to beat them consistently, you're definitely ready to take on human opponents. Brawl gives players a little more room to maneuver, and can turn into an interesting game of cat-and-mouse, especially when one team groups together and tries to isolate their opponents. This divide and conquer approach works very well tactically, and is something you really need to be aware of when tackling this mode. It's almost always a good idea to sprint to your ally and fight alongside them as a team, unless you're really confident in your dueling abilities and have the chance to take on one of your opponents individually. Just make sure keep an eye out for the other enemy – they may very well try to ambush you while you're engrossed in combat. Elimination is a real Battle Royale, with two teams of four facing off against one another. In this mode, almost anything can happen, from multi-way battles to one-on-one duels. A large part of the proceedings are dictated by how well each team moves as a unit, and that can sometimes make pickup groups frustrating – especially when teammates fail to work together effectively, allowing the other, better-coordinated team to isolate and pick them off one at a time. The same is true for the 4 vs. 4 Skirmish, except that it's a little more forgiving because players can respawn and rejoin the action fairly quickly. AI characters are also incorporated into the fight, helping mix up the action somewhat, and making this mode feel a little more varied and interesting than Elimination. Defeating any kind of enemy scores points, be they human or computer-controlled, and the objective is to be the first team to accumulate a score of 1000. Once a team reaches that target, the opposing group's morale is broken, they can no longer respawn, and to win the match, all remaining enemies have to be killed. Finally, there's Dominion; a 4 vs. 4 fight over three control points that are situated in different parts of the battlefield. As is typical of a mode of this ilk, you gain control of a zone by standing in its presence uncontested for a short period of time, whereupon it starts to generate points. Similar to Elimination, the objective is to be the first team to reach 1000, whereupon the opposing team's morale is broken, they can no longer respawn, and whoever's left has to be eliminated to win. This mode is by far my favorite, and it just feels really dynamic; a battle that often ebbs and flows as each team gains and then loses the advantage. As you play PvP games, you garner experience that levels up your character and earns them passive and active feats that can be used in battle to gain a minor advantage. Steel is also awarded at the end of a game. This in-game currency can be used to unlock characters, as well as items that enable you to customize the appearance of your hero. Finally, random armor also drops that you can equip to take advantage of their stats – as well as further customize your character's look. Armor can also be gleaned from loot crates that are available to buy using steel, or through microtransactions. While I don't have any complaints about the speed at which experience is earned, it must be said that the amount of steel that's doled out at the end of each game seems a little on the meager side. Especially when you consider how much some items cost to unlock, and the hefty price of loot crates. It just means you have to be patient when it comes to earning and unlocking new items – or be willing to shell out real cash to buy currency to accelerate the process. The other criticism I have of For Honor – at least at the moment – is its stability during multiplayer games. Or rather, its lack thereof. I've had a hell of a time dealing with disconnects while playing on Xbox One, and judging by the feedback I've seen around the net, I'm not the only one. One evening, I played nine games, and seven of them ended up terminating early because of network errors. I've since run a series of tests and fixes as recommended on the Ubisoft tech forums, which seem to have cleared up some of the issues, but I'm still getting occasional network errors even now. And those aren’t the only issue – I'm finding that freezes and rewinds are commonplace as players drop in and out of games, and sometimes the proceedings can lag and stutter for no apparent reason. While I'm sure that Ubisoft are working on fixes as we speak, it's just very frustrating. When the multiplayer does work, though, it's brilliant. As someone who puts a lot of time into PvP shooters, For Honor is like a breath of fresh air. Tactically and strategically, it's a whole new brawl game – compelling and involving melee-oriented combat that facilitates brutal, gritty, and oftentimes thrilling battles between players. Unfortunately, the campaign isn't anywhere near as exciting as its multiplayer component. Clocking in at a modest six-or-so hours in length, it left me with mixed emotions. The story, broken down into three chapters that contain six individual levels apiece, is set in a medieval world torn asunder by an apocalyptic catastrophe. Following the devastating event, surviving Knights, Vikings, and Samurai – dubbed the Blackstone Legion, the Warborn, and the Chosen respectively – fight one another over land and resources. Eventually, the factions settle into an uneasy peace that lasts for years, until Apollyon arrives on the scene. As leader of the Blackstone Legion, she believes that the people have become weak, and wants all-out war between the three factions. The single-player campaign initially follows Apollyon's political maneuverings as she sends her champions on a series of missions to shape events and spark worldwide conflict. The action in the first chapter is viewed from the perspective of several different Knights, which ostensibly gives the player the chance to take the role of various hero types as they complete missions against primarily Viking targets. In the second chapter, the proceedings are seen from a Viking viewpoint, with the player cast as different Warborn characters as they battle the Chosen. In the third and final chapter, the story comes full circle, with the Samurai fighting back against the Blackstone Legion, which culminates in a face-off against Apollyon herself. Missions are comprised of a series of very clearly articulated objectives. At the start of a level, a waypoint is highlighted that you head towards, killing any enemy soldiers that block your way. The majority of them are grunts that can be swiftly dispatched with a light attack, but there are a few that are tougher, and can be locked onto so you can duel them. Objectives are a fairly mixed bag. Sometimes there's an action to perform, such as using a mechanism to open a gate, raiding supplies, or sabotaging siege equipment, while others take the form of a boss character, or a group of soldiers that you have to defeat to progress. There are also a few missions that involve slightly more complex tasks, such as teaming up with AI allies to fight hordes of enemies and push them back to a certain point on the map, protecting a siege engine as it's moved towards a castle's doors, or defending an NPC from enemy attack. Most of the time is spent fighting from one objective to another. It's pretty straightforward, and as long as you're familiar with the game's combat controls, wading through the bulk of the enemy is quite easy, and indeed becomes rather repetitive after a while. It just feels like busywork – padding to keep you occupied as you travel from point to point. Fortunately, you can actually avoid a lot of this kind of combat by simply sprinting past groups of enemies and making a bee-line straight for the next objective. Once you reach and activate it, the game moves onto the next event, and any soldiers you previously ignored just disappear. While it feels a little cheesy, I preferred this to battling every grunt and AI character I encountered. Doing so would have made the game very tedious, as most low-level characters are just not very exciting to fight. The boss battles are far more engaging and challenging, however. They're few and far between, but these set pieces are often quite spectacular duels that require you to use your full repertoire of moves to succeed. The AI is generally very good, and I had to tackle several boss battles multiple times before I could work out the correct strategy to best them. Some characters can be defeated by being quite aggressive and going on an all-out offense, while others just keep on swinging at you, requiring you to continually block and parry as you try to execute counter-attacks whenever the opportunity arises. This is the campaign at its best: It basically showcases the Art of Battle system and uses it to deliver tense and gripping duels where your skills are truly tested. That said, there were a few instances where I did manage to cheese the AI – or at least, it felt like I did. As you progress through the story, you earn feats (perks) that you can add to your loadout to give your character custom abilities. Examples of these include passive effects such as increasing your damage, and cooldown spells that enable you to rally your allies, or heal yourself. In certain circumstances, I found I could run away from a boss character, heal myself, and then keep my distance as I waited for the spell to cool down. Once it was ready, I'd return to battle, and repeat the process if I was hit several times. It basically felt like an exploit. Perhaps it's shame on me for not playing properly, but this is a game, after all, and unfortunately, I'm going to use every trick in the book to succeed, even if it feels like I'm abusing a design flaw. Thankfully, it doesn't work for every battle, but there are definitely a few where you can use this hit, run, and heal tactic, and it just seems like a bit of an oversight. Ultimately, For Honor's campaign left me feeling largely underwhelmed. On the positive side, it's visually outstanding. The highly detailed characters are beautifully rendered and animated, and their weapons and armor are absolutely terrific. The landscaping, scenery, and story cinematics are also top-of-the-line. Clearly, a lot of work has been put into the design and architecture of the game's locales, and the results have paid dividends: For Honor is a stunning-looking game, with some wonderful settings in which to do battle, from ancient castles through Viking villages to medieval Japanese cities. However, while I love the game's visuals, the voice acting really didn't work for me. The dialogue, phraseology, and delivery sounds very contemporary, and doesn't seem to fit with the game's medieval theme. Also, almost all the characters wear helmets or facemasks, but it doesn't sound like they're speaking through them. While I'm sure that having that level of realism would have made the dialogue muffled, it's nevertheless a little incongruous to hear two helmeted characters talking to one another as though they're speaking directly into a microphone. And call me fussy, but I'd have loved the different faction's heroes to speak in their own languages. Listening to their American accents just breaks the immersion for me. But really, it's the gameplay where I think that For Honor's campaign is a disappointment. While there are a few entertaining set piece objectives, including goading a rampant elephant into charging at a castle's gates, and using a ballista to mow down enemies, and although most of the boss battles are challenging and fun (when they're not exploitable), the bulk of For Honor's story mode is fairly repetitive. Even when you're avoiding most of the grunt soldiers by simply running past them, there's still way too much mundane hacking and slashing as you scythe down the enemies in droves. It starts out fairly enjoyable, but unfortunately the novelty soon wears off, and it simply becomes tedious. Like I said, it feels like busywork designed to pad the game out between objectives. 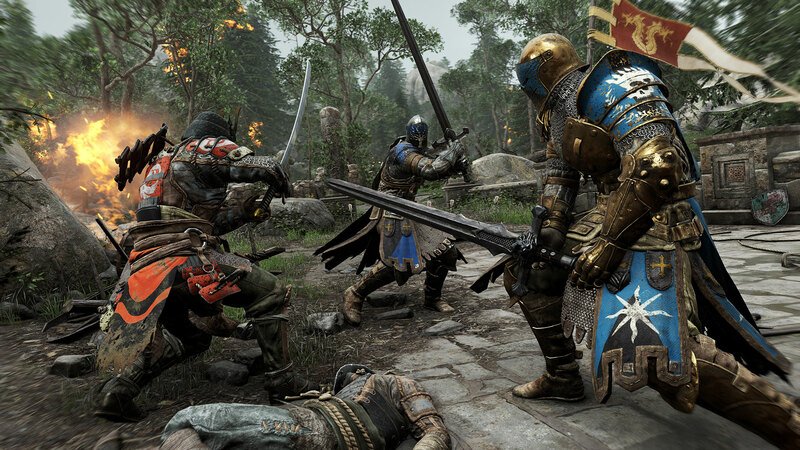 What's clear is that For Honor's Art of Battle system is complex and nuanced, and works really well to deliver tense and exciting duels. Facing off against an opponent is a thrilling strategic battle of reflexes, wits, and combat creativity that can be incredibly involving. The problem with the campaign is that it only occasionally uses the Art of Battle to its fullest potential – when you're dueling bosses. For the most part, it's a hack 'n' slash game that's just not particularly engaging and entertaining. If you crank up the difficulty, it can be a real challenge, but even then, you still can't get away from the fact that most of the time you're fighting grunts in fairly repetitive group combat. It just isn't particularly fun. Still, the Campaign does do a good job in teaching you the game's basics, and is a decent precursor to the multiplayer, which is where For Honor really shines. I've put a lot of time into this aspect of the game over the last week or so, and the more I've played it, the more I like it. The different heroes all have their own distinct feel and playstyle, and learning how to play them has been a really enjoyable experience, from darting around the map attempting to ambush other players with the Assassin's deadly combos, to wading into battle as a Heavy, smashing all and sundry. The only thing that really lets down For Honor's multiplayer is its somewhat lean roster of maps. While a dozen sounds like a reasonable number for launch, not all are shared across the different multiplayer game modes, and even though there are variants, they're just not significantly different enough from one another. As a consequence, it didn't take very long for me to become very familiar with them. While this isn't going to stop me from playing the game, the lack of variety in terms of the maps is still a little disappointing. 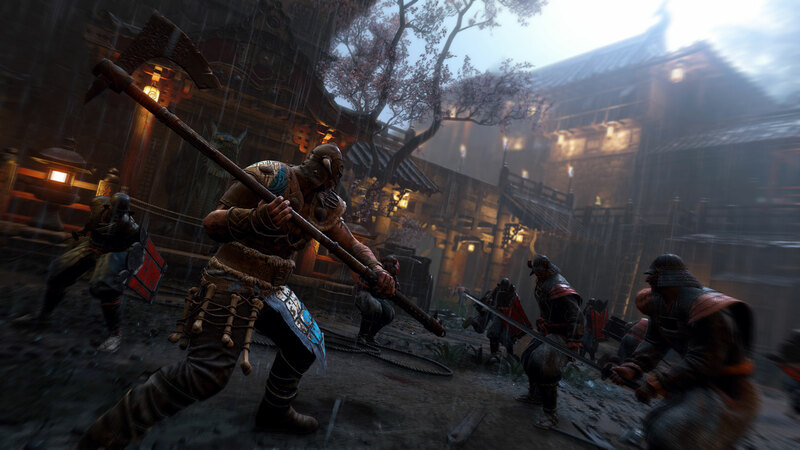 The good news, though, is that For Honor will be supported by four individual DLC updates over the next twelve months that will deliver additional maps, modes, and heroes. In many respects it reminds me of Rainbow Six: Siege, another game whose content felt a little sparse at launch, but which has expanded over the past year to become a more well-rounded offering. Yet despite its rather limited roster of maps, I'm still a big fan of For Honor. 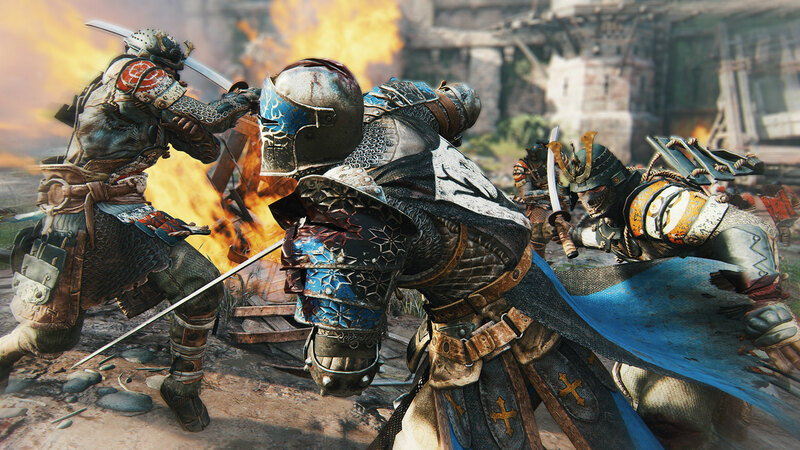 Few other games have managed to capture the sheer grit and brutality of a medieval battlefield in the way that For Honor does. 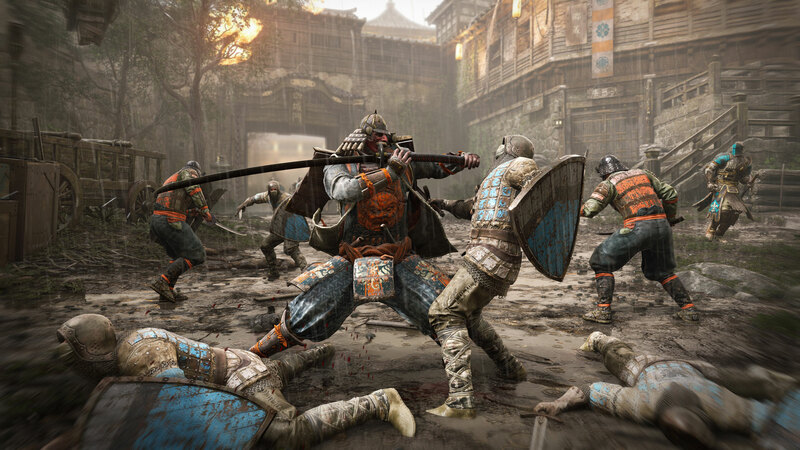 Whether you're going toe-to-toe with an opponent, desperately trying to defend yourself from attack by multiple enemies, or working as a team to methodically hunt down the opposition, For Honor is a really innovative and thoroughly compelling fighting game that can deliver some truly epic battles. Comprehensive, and easy to navigate. 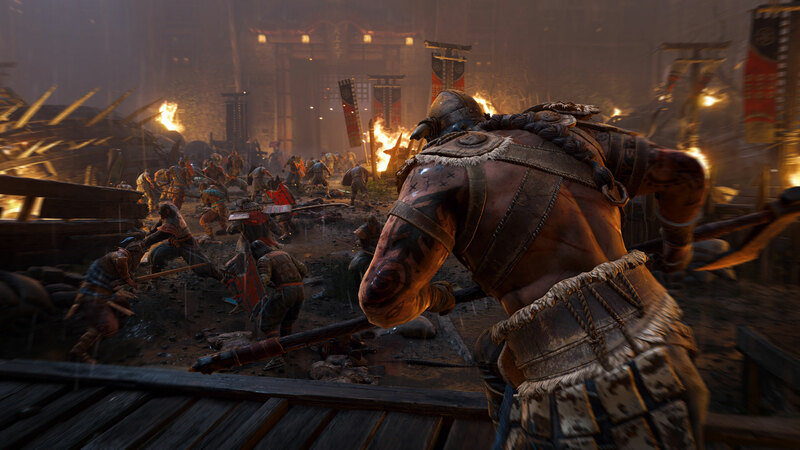 Assuming the game's multiplayer aspect is appealing, For Honor offers plenty of long-term potential. Buying the game just for the campaign is not recommended, however. The music is nicely atmospheric, and the terrific sound effects make battles sound epic. The heroes are beautifully rendered and animated, and the environmental landscaping is absolutely top-notch. On this day of pranks, Ubisoft has actually implemented a special event in which you can fight its lovable creatures.